How do you know that you may need a large Commercial Water Filter? If you need to process over 12 or more gallons per minute, or if an incoming water line is 1.5" in diameter or larger, you may need a commercial water treatment system. Or if your need a water purification device capable of removing a specific contaminant, such as arsenic, fluoride, nitrates, iron, scale / water hardness etc. 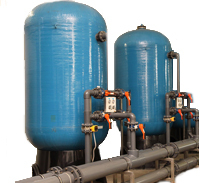 In some manufacturing processes and hospitals you may need an industrial water filter to provide high purity DI water. A typical large tank-based Commercial Water Filtration system consists of one or more media holding, Poly Glass mineral tanks with a mechanical all-brass valve or an electronic metered Fleck® controls. Units with electronic controls are self-backwashing. A second group consists of Commercial Reverse Osmosis Systems capable of filtering from 500 up to 10,000 gallons per day.